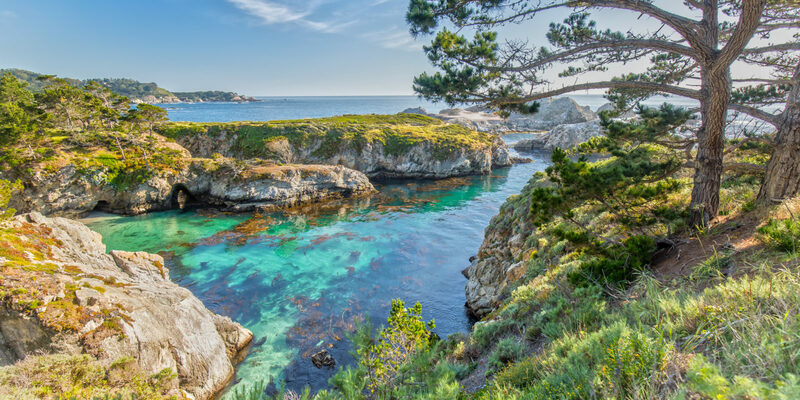 California’s foggy northern coast may be best-known for the Golden Gate Bridge, cable cars and Chinatown, but venture just a few hours south to glimpse a natural California treasure: Carmel’s Point Lobos State Natural Reserve. My husband and I have spent plenty of time in sunny southern California, from Santa Barbara all the way down to San Diego. But we’ve always longed to see a different side of the state — the San Francisco area’s iconic rocky coasts covered in fog. 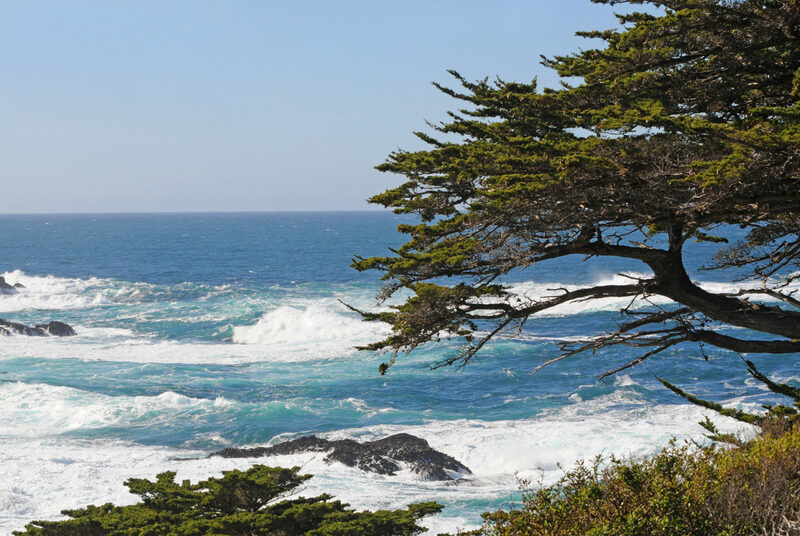 With a rare opportunity for just the two of us to steal away on a vacation, leaving our children in the care of grandparents, we booked a flight to Monterey, California. We planned to venture down to Big Sur, with its dramatic vistas and towering redwoods, and up to San Francisco, home to classic barking sea lions and cable cars aplenty. But in between the two, we enjoyed a quiet few days in lovely Carmel-by-the-Sea. About two hours south of San Francisco, the charming community of Carmel-by-the-Sea once called Clint Eastwood mayor. 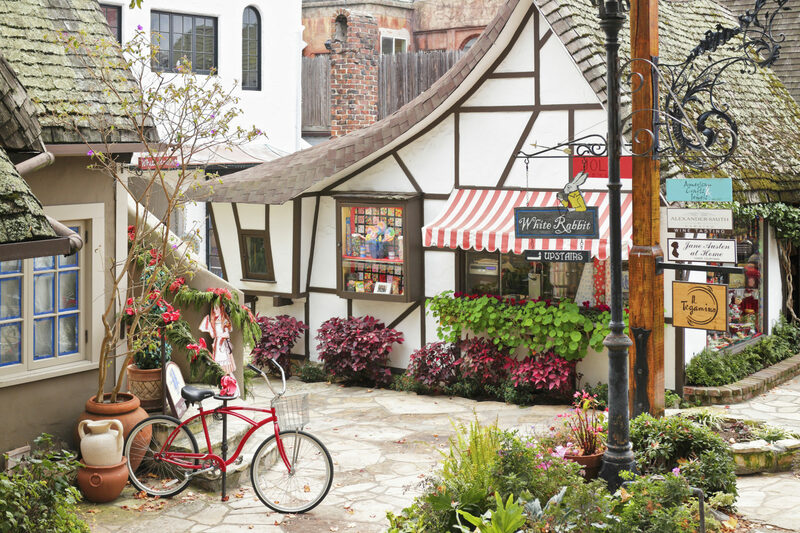 During our stay in the village, we explored fairy-tale homes by bike and meandered through quaint shops and restaurants. But our favorite memory was our day at Point Lobos State Reserve, nicknamed the “crown jewel” of the California state park system and located just two miles south of Carmel-by-the-Sea. Planning for a day of hiking, we stocked our backpacks with lunch and water in the early morning fog. Then we drove a few minutes from town to immerse ourselves in this wonderfully untouched slice of Mother Nature. Make time to stop by poet Robinson Jeffers’ Tor House, which is open for tours on Fridays and Saturdays. The poet lived in a simple stone cottage by the ocean and built an Irish-style stone tower by hand, which you can still climb today for 360-degree views. Unsurprisingly, it was a misty day along the Carmel coast for our hikes. But the sun peeked through the rays just enough to make the blue waters sparkle. We had dressed in layers, so as the temperature warmed and cooled with the sun and the ocean breeze, we easily added and removed our pullovers and light jackets to stay comfortable on the hikes. And the hikes were worth the effort. The vistas from Point Lobos’s trails are truly incredible: giant rocks jut dramatically from the turquoise blue waters of the Pacific as powerful waves relentlessly pound the rocky coast. 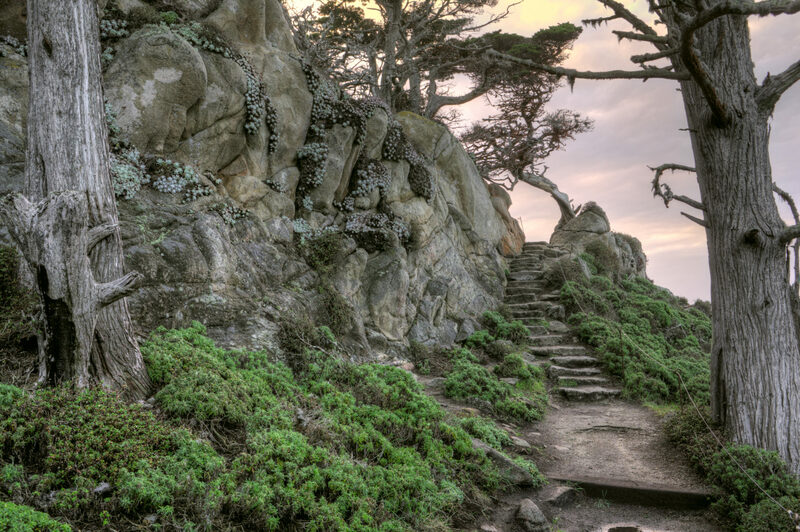 The park is also the home to one of the only two natural stands of native Monterey cypress. In fact, you’ll see these fascinating, gnarly trees at every turn, offering framed views of the water and wildlife. Surviving in the salty spray and wind for 15,000 years, the cypresses are a testament to the resiliency of Mother Nature. Along the Sea Lion Point Trail, we came across the sea lions we had hoped to see. 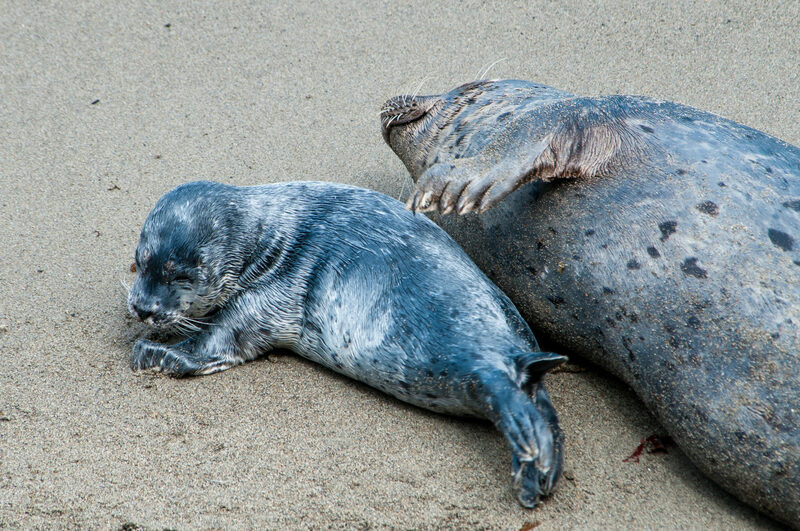 But we were dismayed to see two people venturing off the path and causing the seals with their babies to scuttle back into the water, directly ignoring the signs that pleaded for hikers to not disturb them. But later, we were pleasantly surprised to see these iconic sea creatures along the Cypress Grove Trail as well. As we strolled out of the Allan Memorial Grove of cypress trees along the path, we came across several hidden coves set deep within the rocks’ recesses. As we passed by, we were able to watch the sheltering seals and sea lions as they bathed in the sun. Each time we hiked along the coastline, we strained our eyes looking far out into the ocean, hoping to catch a whale’s tale peeking from the sea or a great spout of water that might alert us to their presence. Unfortunately, our May visit was in between prime whale-watching seasons. Had we visited between December and March, we would have likely spotted gray whales off the coast — and summer hikes offer ample opportunities to spot blue whales. So we’ve left that bucket list item for our next trip back to this beautiful region. Whalers Cove and Bluefish Cove are popular spots with snorkelers. 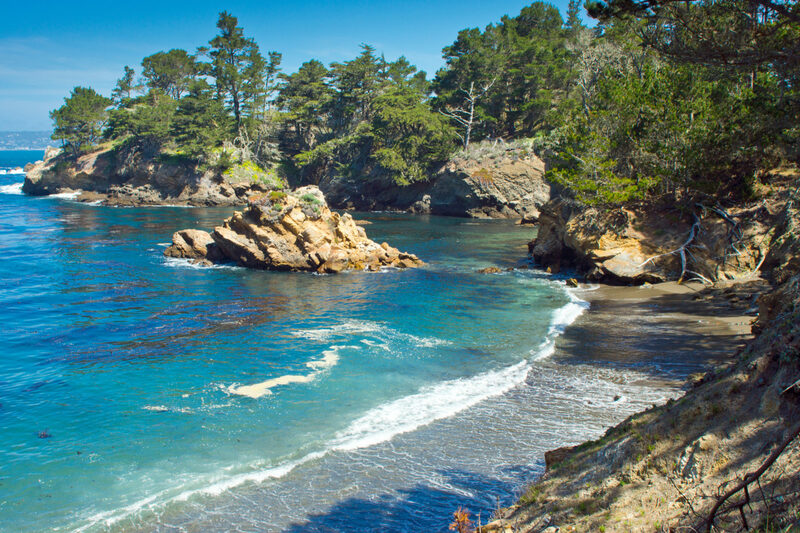 The Point Lobos State Marine Reserve — one of the richest marine habitats in California — boasts kelp forests and many marine animals, including rockfish, lingcod, and, of course, harbor seals and sea otters. If you’re interested in snorkeling, make a reservation ahead of time; the reserve limits the number of divers each day.